So, let’s truthfully answer the question that it seems everyone is asking us, “Did Holly Willoughby achieve her weight loss following a visit to your Elite Clinic in Marbella and completing the Gastric Mind Band Treatment? Well no, Holly Willoughby did not, which is a shame for us. Holly Willoughby appeared on the Lorraine Kelly show, and of course a number of past clients of the Elite Clinic have also shared that sofa, which is probably where the confusion may have crept in. Of course, it is true that a number of celebrities have made the trip to our clinic, some we can mention, and others we cannot. Anyway Holly Willoughby looked amazing on the Lorraine Kelly show. We admire the transformation, as, it seems, do thousands of her fans. Helen Lederer, the comedienne who featured in the hit TV show – Absolutely Fabulous and more recently on Sky TV, following her spell in Celebrity Big Brother, did visit the Elite Clinic. Following her GMB Weight Loss Treatment she documented her weight loss journey and experience in an article that appeared in the Reader’s Digest Magazine. Her weight loss did not help her win Celebrity Big Brother, which was sad. after visiting the Spain-based, British Elite Clinic, and completing the Gastric Mind Band, a Psychology-Focused treatment. The GMB treatment incorporates PBT, which has been termed as ‘Super CBT’, an upgrade to CBT that was developed in-house. PBT is now the subject of a book published globally by Hay House, “Pause Button Therapy”. Kay Lindley lost 105 pounds and reversed her Diabetes after completing the same treatment; she also sat on Lorraine’s sofa alongside doctor Hilary Jones. 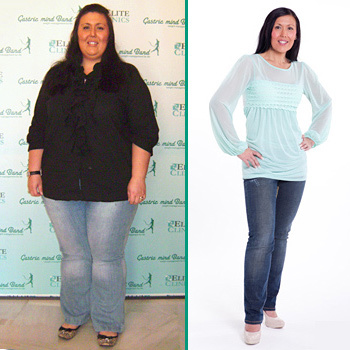 Kay completed the treatment a few years back and, like Sarah, has maintained her healthy weight. She is still proud of her appearance on the Lorraine Kelly Show. Claudia Connell, from the Daily Mail newspaper, travelled over to Spain to undergo the treatment on behalf of the paper, after which she wrote a double page spread about the treatment. This resulted in a five month waiting list, with clients, both members of the public and celebrities alike, flying to Spain from around the world. You can read Claudia’s story on the main page of the site. As we say on the home page of our website, “helping people to lose weight is challenging, but achievable. Our secret bullet is making sure that the client’s weight loss is permanent, otherwise, really what’s the point? On the pages of the GMB website you can read the full story of both Sarah and Kay, and see their verified before and after photographs. If you need more convincing, on the Clinical Evidence page you can read the results of research into the treatment by Dr Sarah Clarke, as presented at an International Psychology Conference at Warsaw University.